After our last class, our little filmmakers came ready with their first drafts of their scripts, ready for a table read. Miss I’s was actually a rewrite, as she made some changes after the suggestions given to her last week. 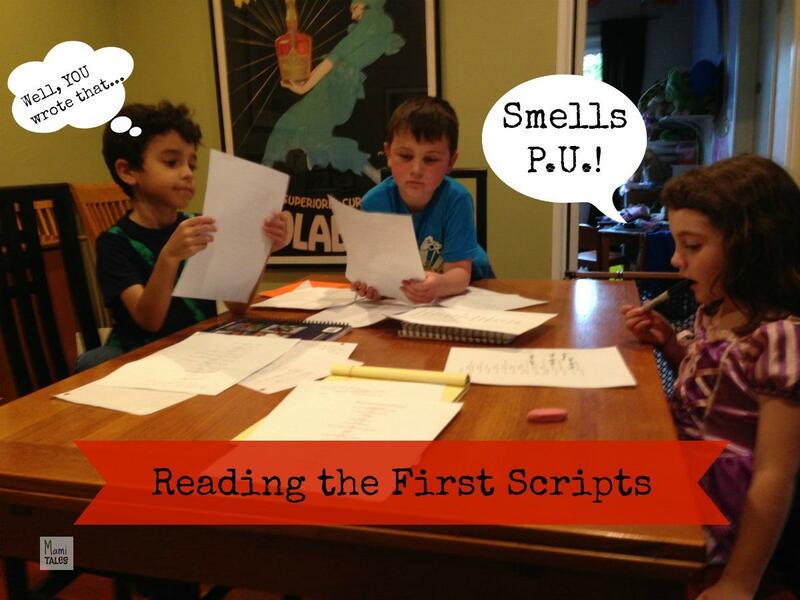 So today we have the kids reading scripts they’ve been working on for a couple of weeks. After they read their scripts, we talked a bit about what they have felt about HEARING what they had written. They did not really think much about that. They just loved to have their friends read out loud what they had worked on. Next I asked them what was actually happening in actions… because most of the dialogues were not clear on what was visually going on. They each told me their story, and as their next assignment they are supposed to bring back their script with stage directions and action descriptions instead of dialogue. We’ll see how that goes! If I came in Marvel, I would go on quests and get zoom units. There are many in the game. My favorite quest I love battle realm. There are 3 levels: easy, medium and hard. Easy you have to punch him 8 times and you win! Medium you have to punch him 13 times and you win! If I could go inside Nancy Drew I would help solve the mysteries and attend fun things, and help out. I’d solve the Bungalow mystery. I’d look at wallpaper and people and make sure to test. If they match the taste of each other, she did it. And when I say taste, I mean actions (NOTE: what she tried to say was taste, as in personal preferences). If I was inside a cartoon, a video game or even a movie, it would be Stampy. I would help him build, I would participate in all of his tournaments, and even do adventure maps with him- I like Stampy a lot. I would play Minecraft every day with Stampy. I would even mine with him. I would craft too. All my filmmakersl wrote the first couple of lines of their stories and said, “DONE!” I would read what they had written and give it back, asking for more details and a specific adventure. I never got very far, specially with the boys… It seems like video games are taking over storytelling… so now even the quests are about hitting or destroying, or just building and mining… but with no actual objective or goal in mind. Another big eye opener on modern day kid’s perception of story. It seems like confrontation is hitting or destroying, more than solving problems using less barbaric methods. All in all, it was great having kids reading scripts, hearing their stories out loud in their own voices. We still have some way to go before we start shooting their actual shorts, as I want those stories to be clear from beginning to end, and with a clear conflict and resolution! What are your kids watching these days? Are you familiar with the content of what they see-play? I try to be, but the access to information and entertainment these days is limitless! Tagged Acting, Funny, Inspiration for Kids, Movie Class.